It’s no longer just about the click. Understanding what happens beyond the screen – like visits to your store – is an important way to measure marketing success. PlaceIQ’s PVR® is a first-of-its-kind measurement metric that measures foot traffic patterns to help marketers understand the offline impact of advertising campaigns. PVR® has become an industry standard for measuring foot traffic and informing media decisions. When paired with additional data sets, location intelligence can help marketers measure their performance at an even deeper level. That’s why we teamed up with comScore – the industry’s trusted choice for impartial measurement in the digital realm. comScore’s legacy in the TV and digital business coupled with PlaceIQ’s extended tenure in the location data space turned out to be the perfect match. 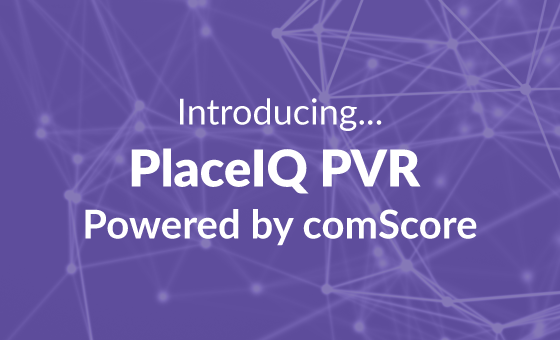 We are thrilled to announce a new, joint solution called PlaceIQ PVR powered by comScore. This innovative offering measures lift in store visitation resulting from TV, mobile, and desktop advertising. Marketers can now connect-the-dots between the offline and online worlds to understand the holistic impact of their campaigns by measuring visitation to physical locations – including retailers, automotive dealerships, dining establishments and more. comScore’s ad exposure data is matched with PlaceIQ’s location data to accurately understand the real-world impact of individual campaign components, such as TV networks, digital publishers, dayparts and placements. comScore can further integrate viewability measurement to optimize spend by only accounting for impressions that have an opportunity to be seen. This viewable lift data provides marketers with an apples-to-apples comparison of lift across platforms, and enables them to tailor strategies accordingly. In addition to measuring lift, this new solution also provides a detailed picture of campaign-exposed consumers. In addition to demographics, advanced audience descriptors are delivered, such as cross-shopping behaviors. With this information, marketers can understand the broader interests and affinities of an audience, and optimize strategies across channels. With TV PVR powered by comScore, marketers can analyze TV advertising performance through real-world visitation. Let’s say a consumer sees an ad for Audi on a TV station, like Bravo, and subsequently visits an Audi dealership lot. TV PVR powered by comScore enables marketers to measure events like this to quantify ROI and connect advertising dollars with in-store behaviors. With this new product, auto brands can understand how each channel is contributing to lot visitation, diagnose the strongest performers, and optimize against that. With Digital PVR powered by comScore, marketers can analyze their digital advertising performance by understanding store visitation. Let’s say a different consumer watches TV and sees an ad for Nordstrom. Later, when they’re browsing the internet, they receive another ad for Nordstrom. The holiday promotion is too good to give up, and they decide to visit a Nordstrom in person to do some early Christmas shopping. This new solution would enable marketers to analyze this real-world interaction, and gain a deeper understanding of their audiences’ path-to-purchase. PlaceIQ PVR powered by comScore is a powerful way for marketers to quantify engagement, and justify investments. With it, marketers can gain a better understanding of how all forms of media impact foot traffic, the audience affinities behind those interactions, critical insight into viewability for digital campaigns, and the ability to optimize cross-channel campaigns to drive additional visitation. We call that a match-made-in-data-heaven. Reach out to learn more, we’d love to chat about this new offering!